I'm back with the second part of my lookbook featuring outfits from the cutest collaboration with iconic Austin fashion boutique, Maya Star. This week is all about the perfect💕 dress-shorts hybrid, also known as: the romper. 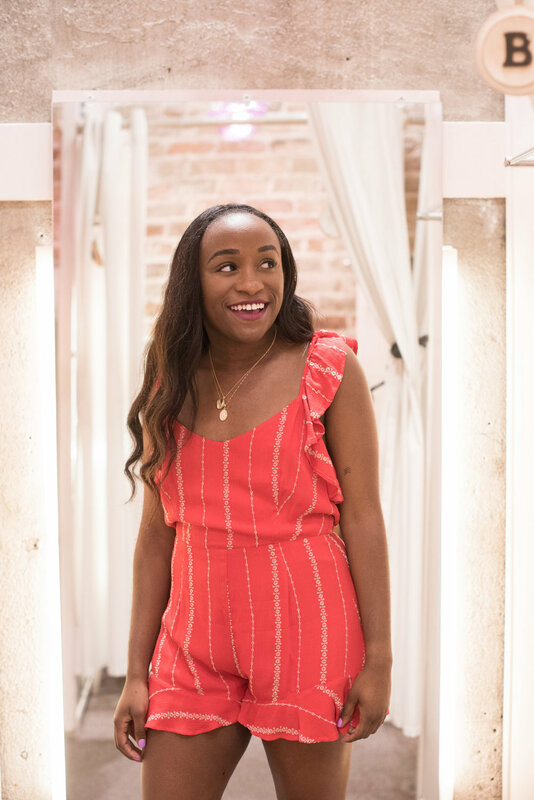 I'm sharing the details on two✌🏾 of the cutest rompers that you need this summer for daytime adventures and hot summer nights. Scroll on, sis! SN: How cute is the interior of Maya Star tho? One of my favorite things about the overall vibe of Maya Star's inventory is that it often channels a bohemian wave that's just too good not to love. This Golden Summer Romper does exactly that with bell sleeves, pretty print and a flowy fit. I kept things super casual with some flat sandals and layered the Bea Star Necklace with another cutie you can find in-store. Because of the dainty yet breezy style of the romper, you can easily dress it up for a happy hour or while on vacation. If you haven't already added this to cart allow me to also mention that orange is having a major moment rn and this color is gorgeous on any skin tone. Out of all the pretty things in Maya Star, this spicy but sweet lil number stole my heart the minute I saw it on the rack.😍 When I slid into the dressing room and slipped it on, I was fully sold. Ruffled shoulders and hems, a saucy red and a high waisted fit give make this romper the perfect ting for date night. If you're looking for a lil something to help you show off them stems👯, issa go! In addition to the all the darling deets, this romper features an open back that ties for a customizable fit and summer-friendly breathability. Strut onto a rooftop bar or toast to a romantic night with a summer fling or significant other looking like a midsummer night's dream. I finished this look with some leather wedges, but you can just as easily grab a cute bag like this Heart Y Sol Yellow Woven Straw Purse and stepping into some strappy heels to heat things up. My first-ever lookbook has been so much fun and I'm so grateful for all the love y'all have been showing me since it dropped. I'm definitely looking to do more lookbooks featuring other fave local boutiques and aesthetics in general. Do you know any collabs you'd like to see on le blog this season or next? Share your thoughts with me in the comments below! I'm dropping more cuteness real soon! In the meantime, get to shopping bb! And since it's Friday, go 'head and splurge one time on a haul from the brand new Maya Star online store. Snag free shipping on orders of $100 or more! I'm coming back before you know it! Let's chat later.